Today’s OTS comes to us courtesy of Marc B in Tampa, Florida. I love this bike! I from the second I saw it, I couldn’t get this out of my head. Uncanny resemblance don’t you think? 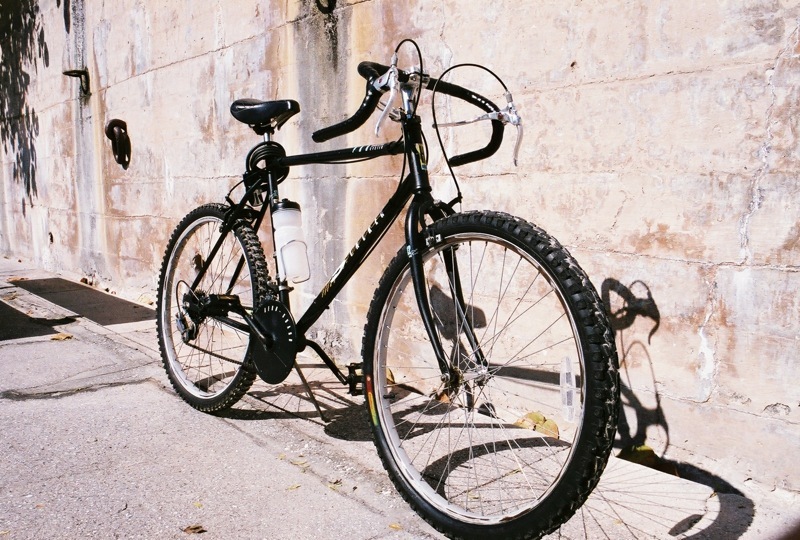 Here are some photos of my huffy stalker. I have owned this bike for some twenty plus years now. It has gone through many incarnations. This model was originally a road going ten speed, but when the mountain bike craze hit, huffy threw some 26″ wheels and knobbies on it and called it a mountain bike. (It has a 53 tooth chain ring on it). I have it set-up as a ‘cross style beater. I believe this bike was produced in the mid to late eighties. Hope you like it. I would call that style (bike) a “Road Warrior” Are those brake-levers off an old Schwinn? yes, they are N.O.S. wiemanns purchased off ebay. The combination of knobbies and road style drop bars is super bad! got the idea from some guys that were sticking road bars on straight-up mountian bikes and calling them “mega crossers” or “super crossers”. not the fastest way around town, but it does look cool. “Super Bad” isn`t that a James Brown song? I was thinking of throwing drops on my old Huffy mountain bike, and now I know it will look awesome! The original quality Bridgestone mountain bkes did come with road bars. I’ve set up my XO-5 B-stone hybrid with road bars and bar end shifts. 38x700cm tires for combo gravel and paved road touring. 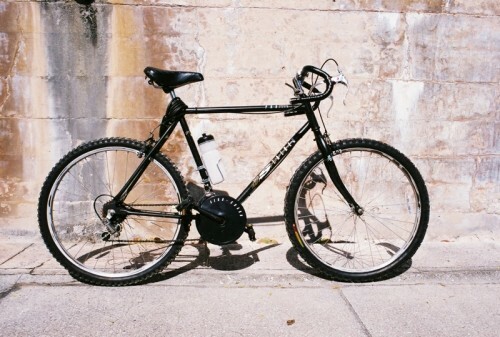 Mark, This reminds me of a bike that GT made circa 1990, when I got my first “Bike Shop Bike”, I picked up a GT catalog that had had two models that were essentially hybrids. One model, however, had drops with 700c knobbies, but not a cyclocross bike. Very cool nonetheless. Especially to 14 year old dreaming of being a road racer but stuck with 3 miles of dirt road between him and the nearest pavement. 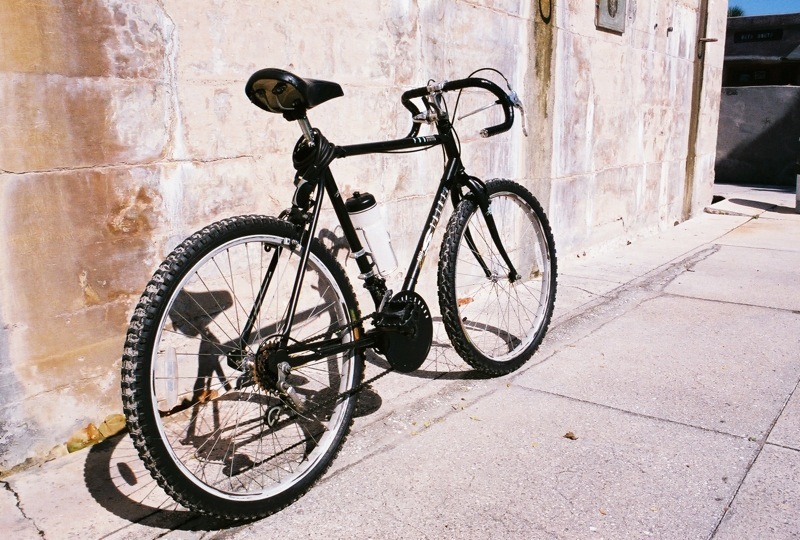 this bike was my daily rider for years. i have picked-up nicer bikes since, and stripped this bike down robbing all the new parts that i have hung on it over the years. i was tripping over the sad, pathetic bare frame in my garage and it’s future was uncertain. on a whim, i went through my spare parts bin and built this up just to sell it off on Craig’s list. when i was done, i could not bare to sell it. (probably why i have so many bikes getting in my way all the time). anyway, i am glad most of you like it. i was afraid it would not fit in on the site.